We’d love your help. Let us know what’s wrong with this preview of Neighborhood Mapping by John Fuder. If your church relocated, would your neighbors notice? Would there be an outcry for you to stay? Whether you are a church planter, pastor, community activist, missionary, college ministry leader, or simply a Christ-follower looking to impact your community, this resource is for you. 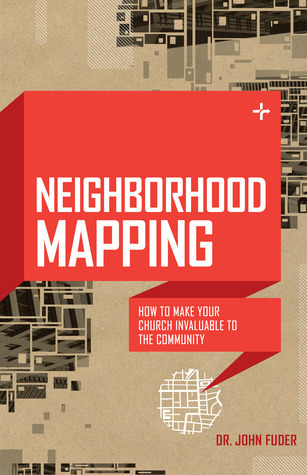 Neighborhood Mapping by Dr. John Fuder is an engaging, practical tool available to assist w If your church relocated, would your neighbors notice? Would there be an outcry for you to stay? Neighborhood Mapping by Dr. John Fuder is an engaging, practical tool available to assist workers in the field to better understand the communities they are involved with. It awakens the neighborhood explorer with effective methodology for "exegeting" their neighborhood, offering surveys and samples to lead them in that process. To ask other readers questions about Neighborhood Mapping, please sign up. Q: What is a community analysis? Q: Why perform community analysis? Q: Who performs community analysis? Q: Where do we do community analysis? Q: When is the time for community analysis? A: Once we are willing to take the posture of a servant and humble ourselves to learn from and listen to our Lord and the needs of the community. Q: How do we do community analysis? A: We do community analysis by networking service providers, finding neighborhood insiders, and identifying the needs of the broader community.